I thought that every cabinet needed a buddy (plant). Every wall needed picture...every floor needed a rug..
How did it turn into a jungle. I don't really have space above my cabinets. Not sure what I would do with it if I had it. Do you feel more free? I know I would. I've been decluttering today, feels good. Yeppers, I used to think that way too! Amen, sista! I am trying to free myself of that thinking too!! I buy plants every chance I get. So if you want, you can send them here. I will love them:) I just bought two miniature roses today at the grocery store. Now if I can only keep them alive until spring. Hey if your need to get rid of any of them you can send them to my house, as my hubby says it is where plants come to die. I only have a green thumb if I've been spray painting. On another note I have a new favorite line from the book. Page33 We all fear that we aren't who we are pretending to be. Enjoy your release from the jungle. Those are some pretty plants in that jungle! 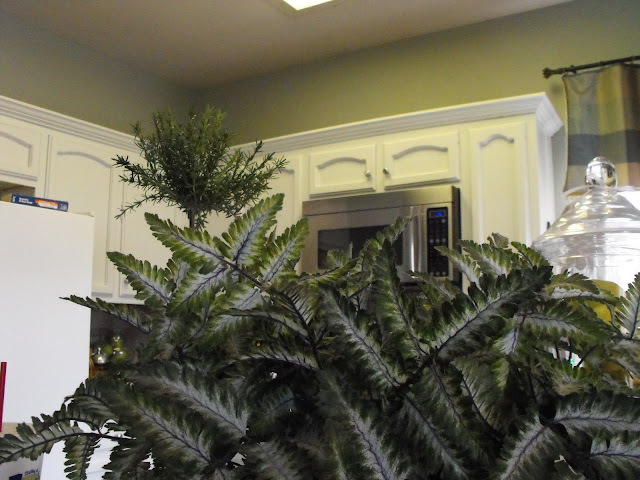 Doesn't it feel different at first to see the cabinets without the plants, when you're use to seeing them up there! I noticed your beautiful white cabinets right away! it so good to be free from the jungle! i relized i had a jungle everywhere too! so i took it all down and love it! your kitchen is so nice! Oh and I emptied out the tops of my cabinets and now I'm loving the space...and also wishing I had cabinets that went all the way to the ceiling, LOL! Sometimes I forget that I have things on top of my cabinets... cake plates, a trifle dish, baskets. It's not for show, I don't have the storage!! And my jungle...it'll go back outside when the weather warms. But I hear you. De~clutter your home and de~clutter your mind!! Hi Susieness! Now, sweetie, where is the ladder? :) I wish I had tops to poke stuff upon! I love seeing your pretty kitchen!! Me tooooo! I am stiill struggling with the rugs....I took the one out of my dining room and had just the hardwood, kept starting at it thinking, It looks NAKED! Put another rug down....happy again! I am TRYING to do better though! Well I think it is all very pretty....but I see your salt/pepper thing on your stove and I had one of those so long ago!!!! I love it! Wonder if they still have those at tupperware? Memories!!!!!! I have space above my cabinets and I have only two plants:) I guess I feel the need to have something up there. Are you leaving it empty or not? not that it didn't look wonderful before....but ti makes it all look so much more clean and crisp without the plants up there!! hop over to my blog and enter my two giveaways! I really don't have much above my cabinets, maybe I should?? I don't have plants because I kill them. Ack! Wait.....wha?????? I think I just heard a TARZAN yell........??????? 80s in that respect. :) Hopefully not any other way. What did you get from Sonic? Cherry limaide! I don't have any plants on top of my cupboards but I do have some knick-knack-patty-whacks that need to go. 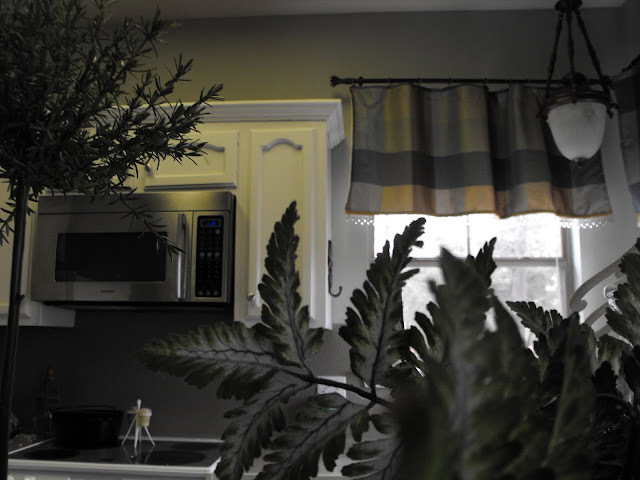 I have been ridding my home of fake green stuff and love it. It only collects dust anyway for the most part. Simplify...it's becoming my theme. Hard habits to break...but do-able. I love your little rosemary topiary. Anyway, I know how you feel and I go through phases. Sometimes I like things less cluttered, other times I want a rich, full, warm look. There are nooks and crannies all through my home that are in DESPERATE need decluttering. Right now...I am looking at one. Looks like my husband's lovely habit of PILING things has now evading my psyche b/c I see a PILE of MY stuff that needs to be sorted. Thank you so very much for the sweet wishes and tips for my upcoming trip. I have always loved house plants but I'm considering getting rid of most of them due to the fact of what a pain they are to clean. Whats a girl to do...? I thought the same thing before but now I love the fact that I don't have to dust the crap above the cabinets anymore, it is pretty freeing. 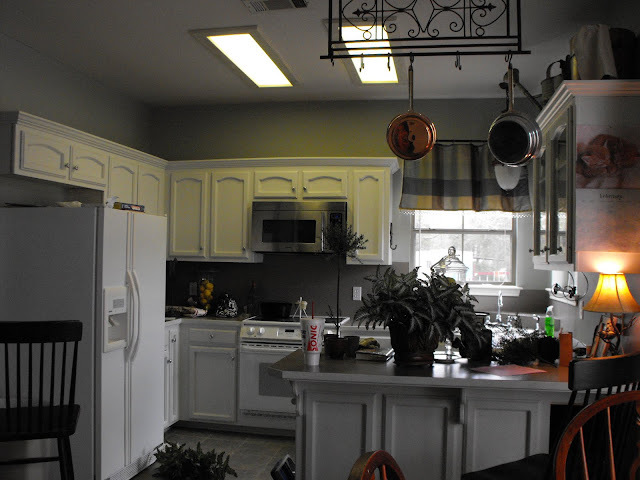 I think your kitchen looks great without anything above the cabinets!